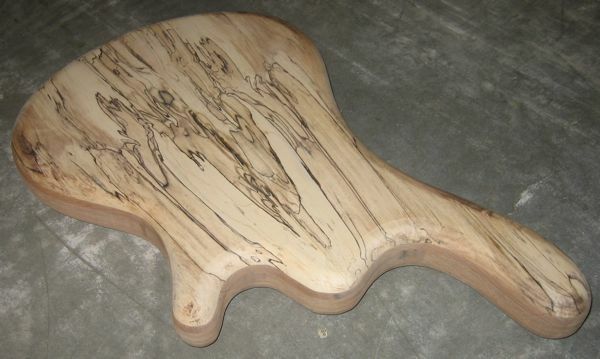 I made the design on MDF. 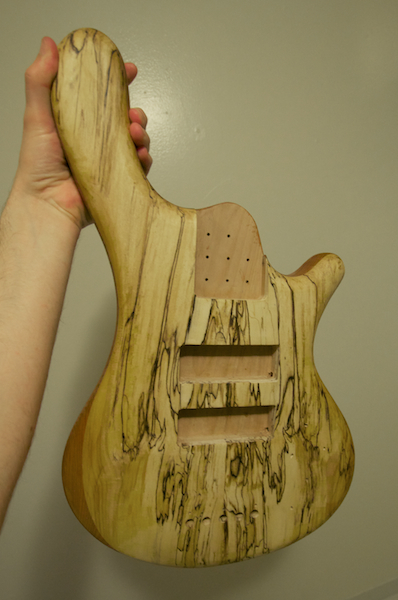 I was able to thin down the top and bookmatch it. 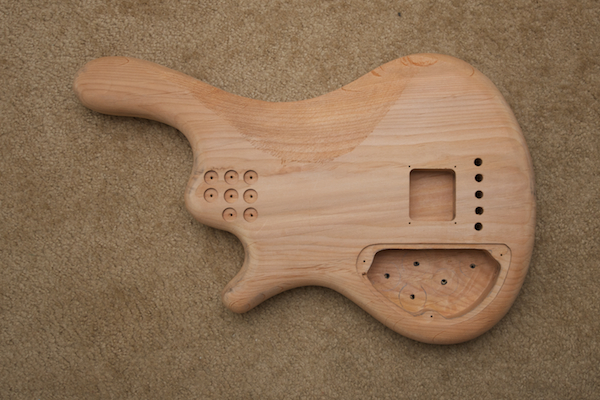 I was then able to glue the top to the body core and it is drying right now. 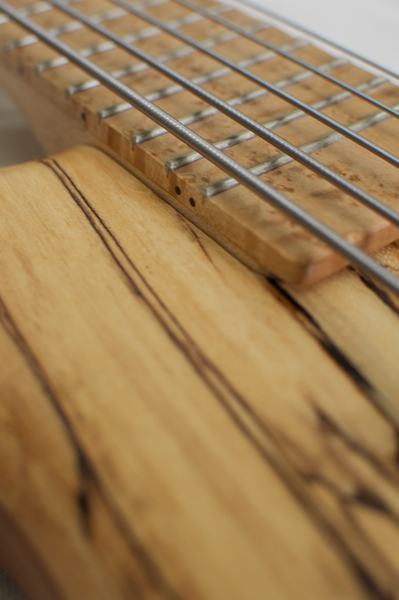 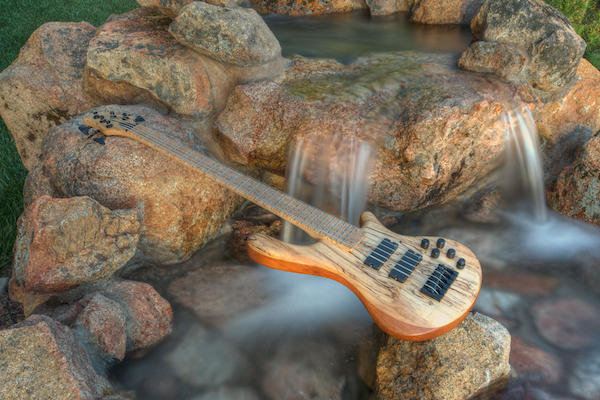 The picture has a scrap fretboard just for color reference. 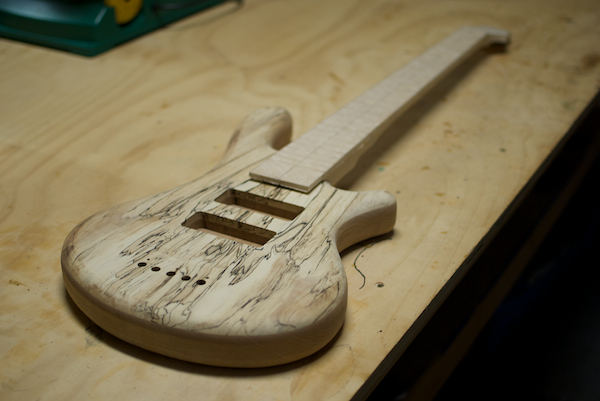 After gluing the body together, I rounded over the edges. 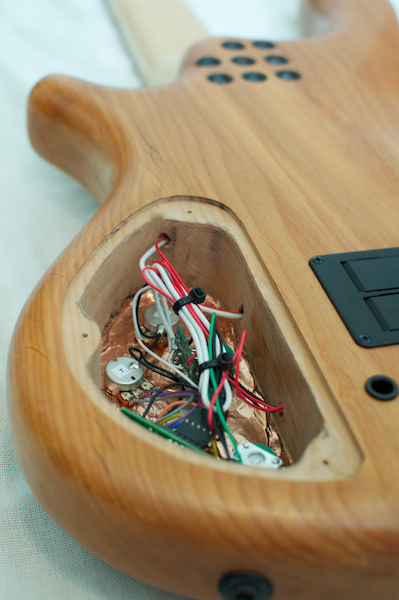 I was also able to route the pickup cavities and rough the neck pocket. 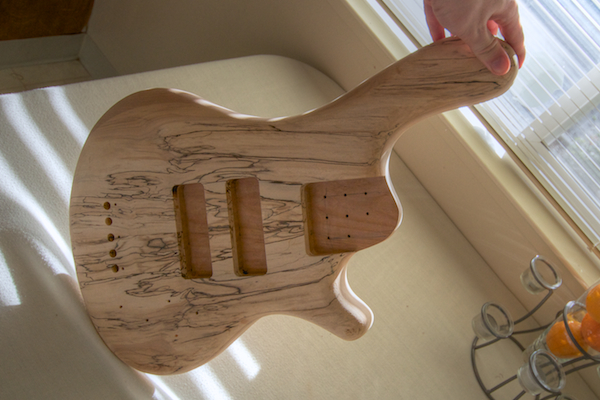 Today, I turned a block of maple into something the resembles a neck. 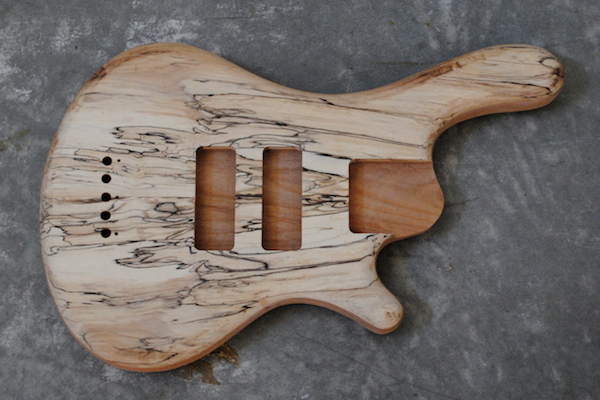 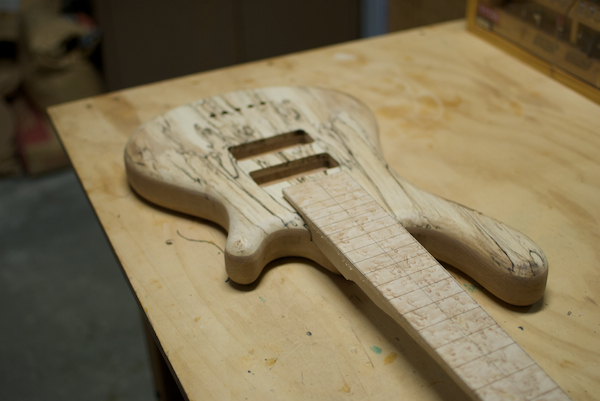 All of the neck has been cut to final size and the profile is being roughed out as we speak. 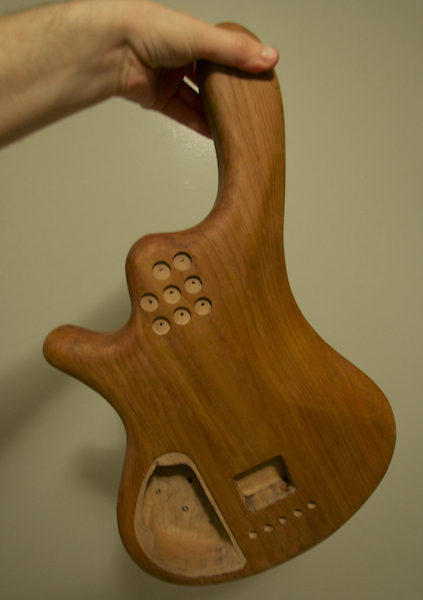 That allowed me to finish the neck pocket as well. 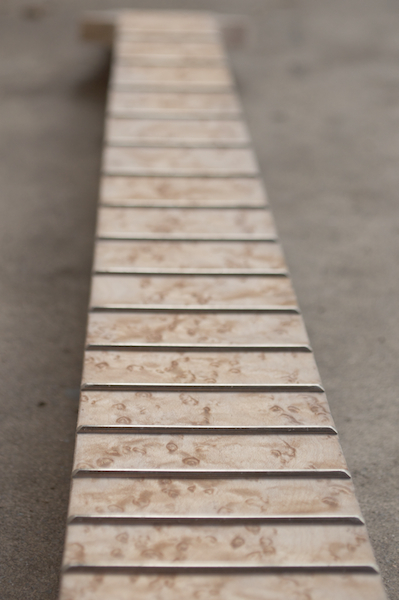 I got a killer piece of birdseye maple and was able to cut the fret slots, trim it to size and glue it on the neck today. 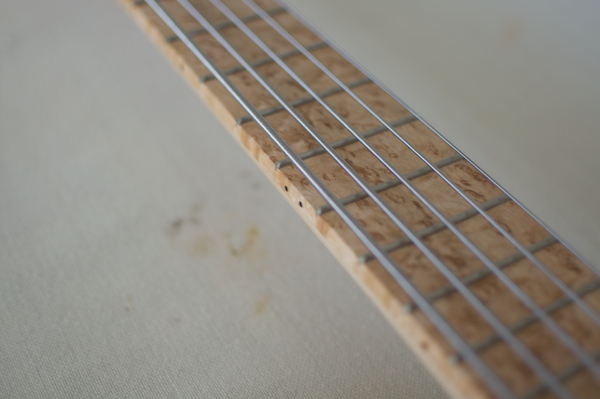 The frets are in, still need to file them down though. 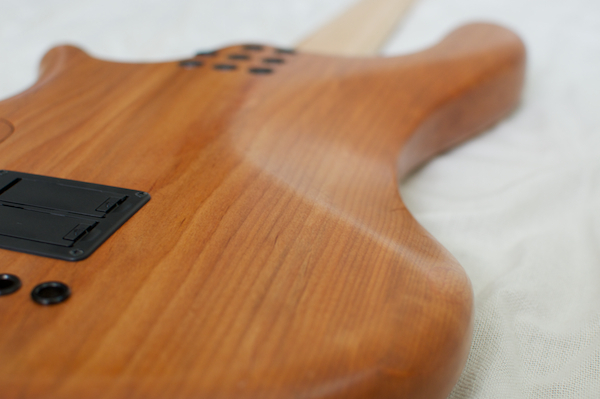 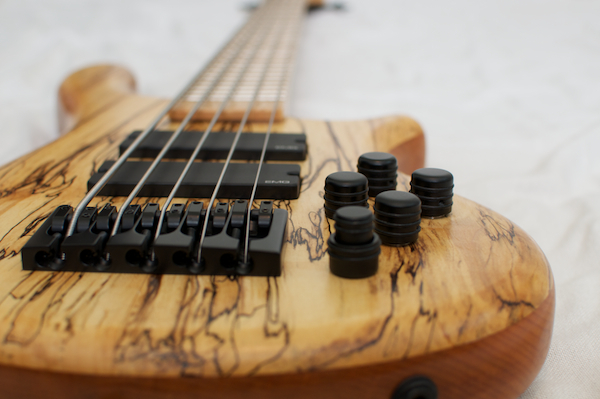 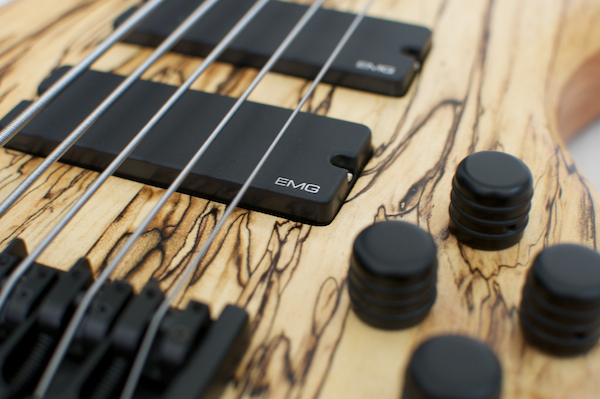 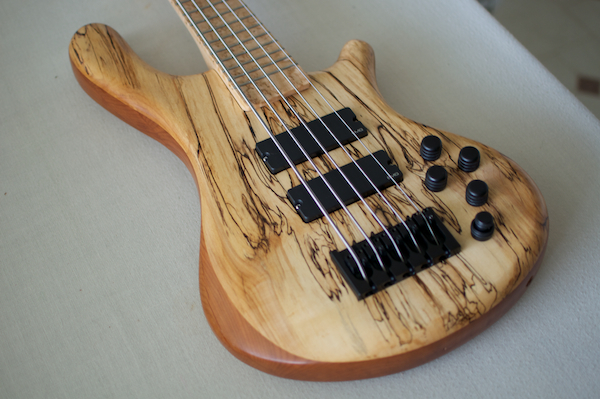 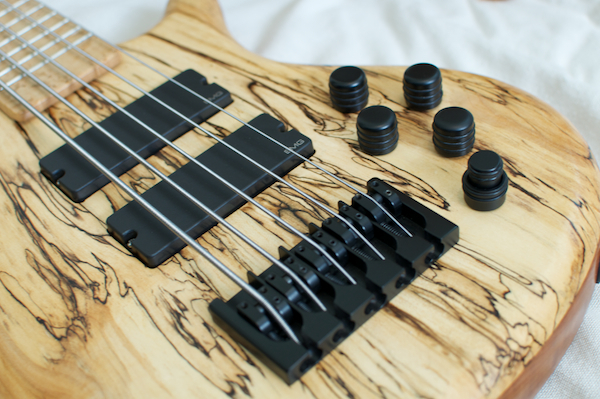 This neck made me really appreciate maple being so soft compared to the last 4-5 basses I’ve had to fret. 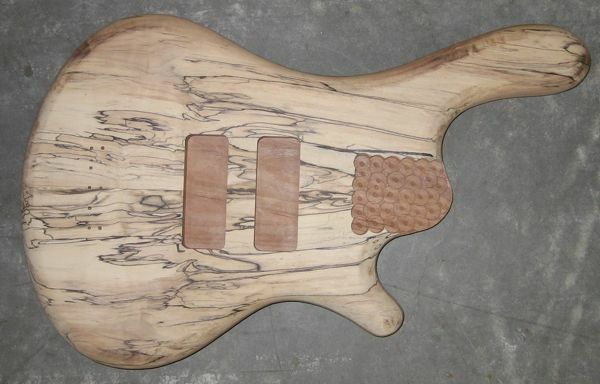 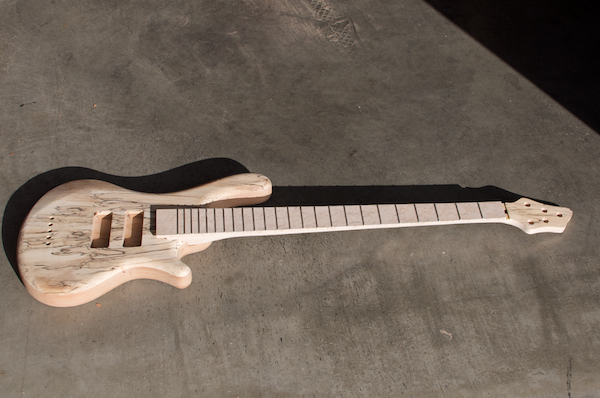 The fretboard is done and most of the neck carving is as well. 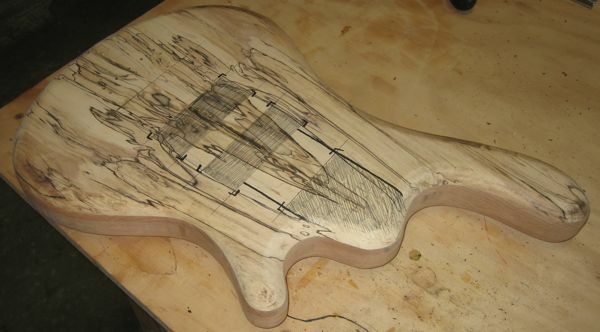 I just need to get it with the body so I can make the heel transition. 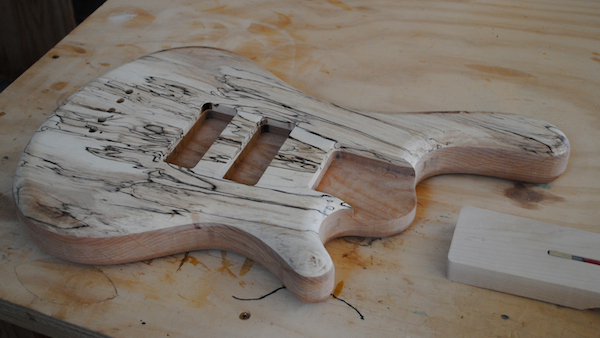 I haven’t been doing many updates because I’ve just been sanding and such. 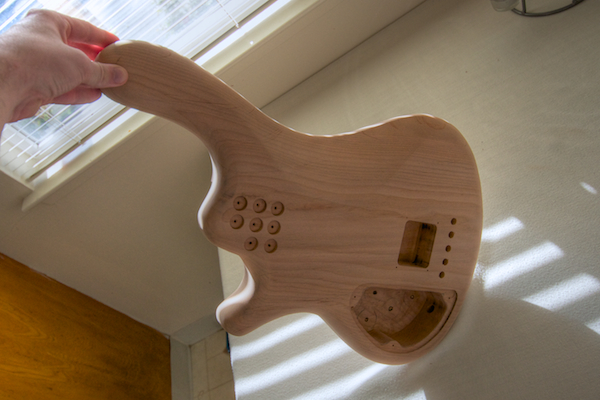 I did the knob layout, made the contours deeper (still need to do more) and drilled a bunch of various holes. 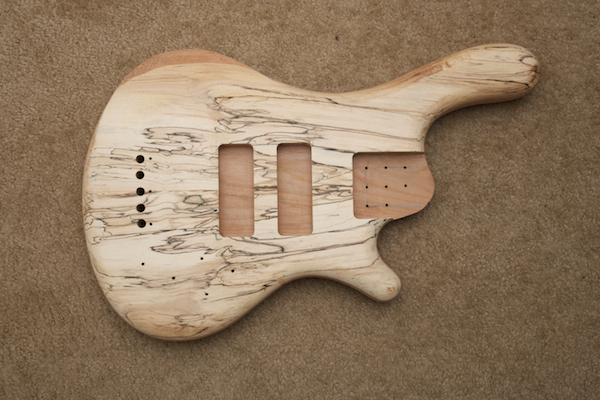 I am in the finish sanding stage, still at 120 grit though. 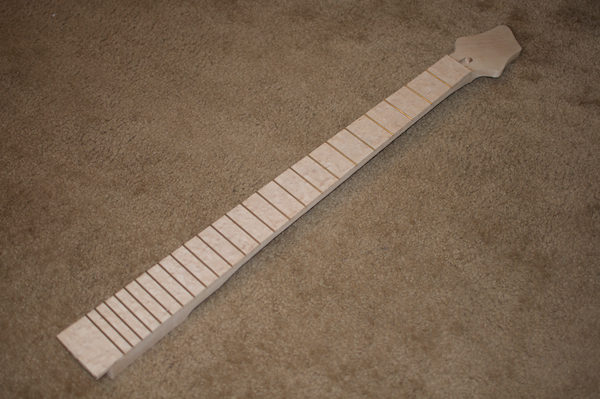 The neck has been sanded up to 400 grit and just needs the end of the fretboard trimmed to final size. 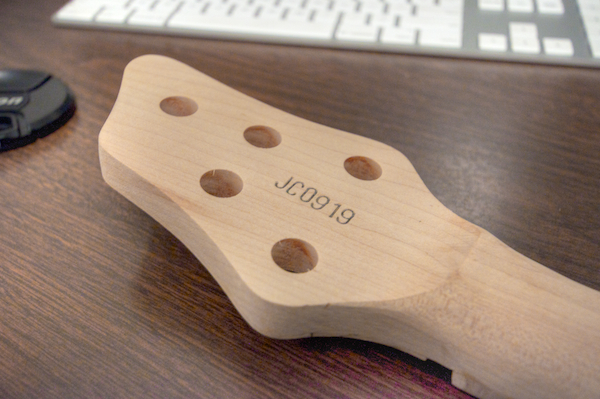 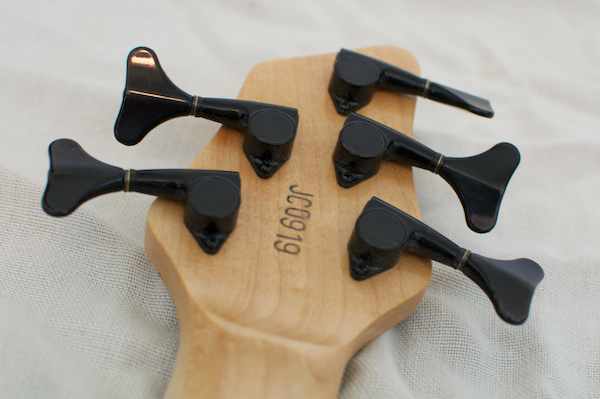 I was also able to burn/stamp the serial number “JC0919” into the headstock. 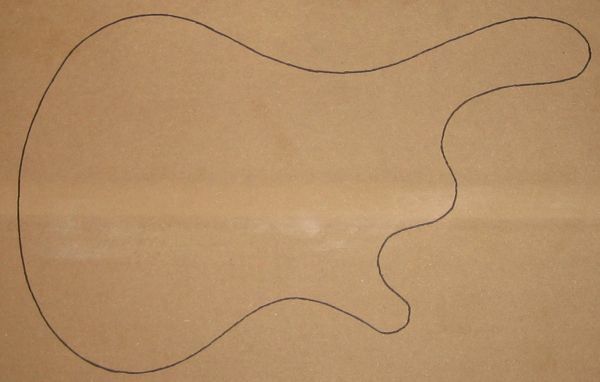 The thing with burning it in, you only get one chance to line it up. 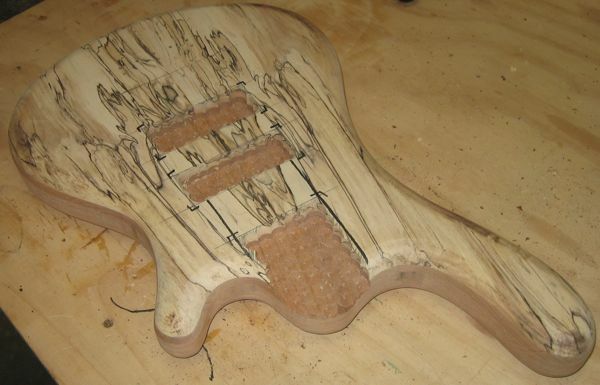 So that is why it isn’t perfectly straight. 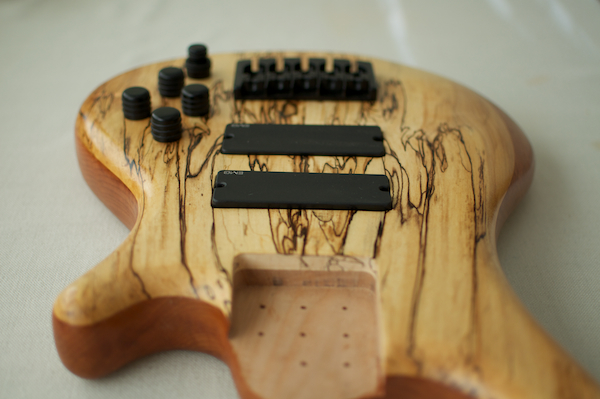 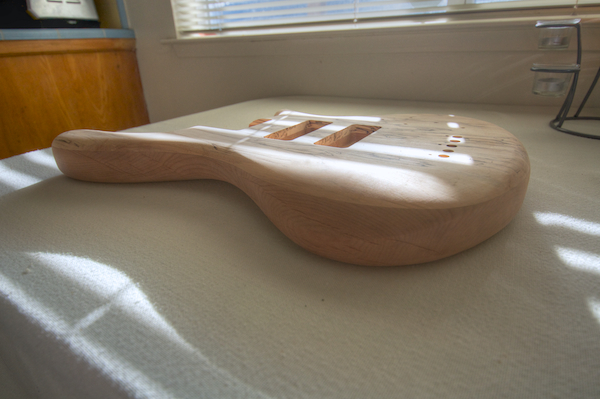 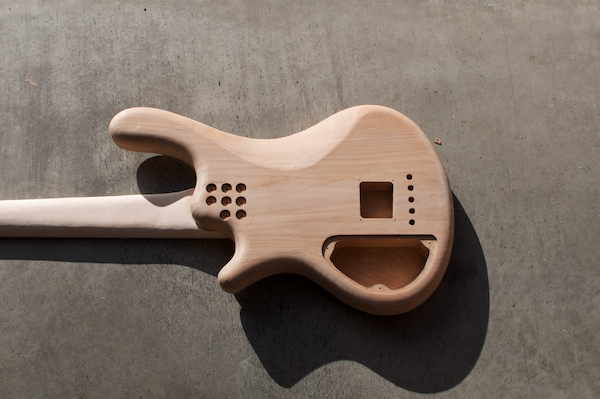 First coat of tung oil on the body and neck. 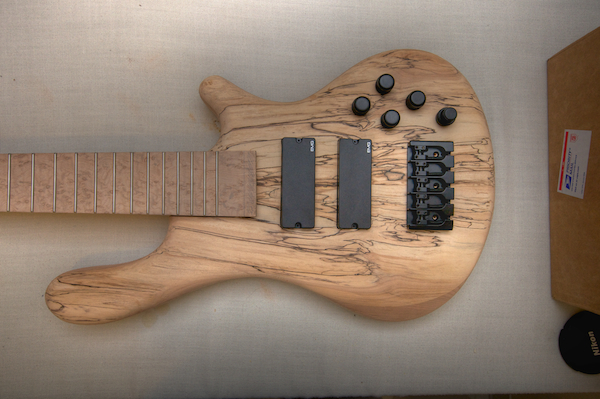 Finish is pretty much done, just doing a test fit of everything.